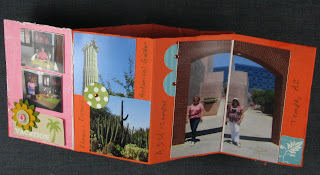 I'm just barely squeaking this in on time for Scrapfit's Workout #50- Be Inspired By A Book! I used Who's at the Zoo?! 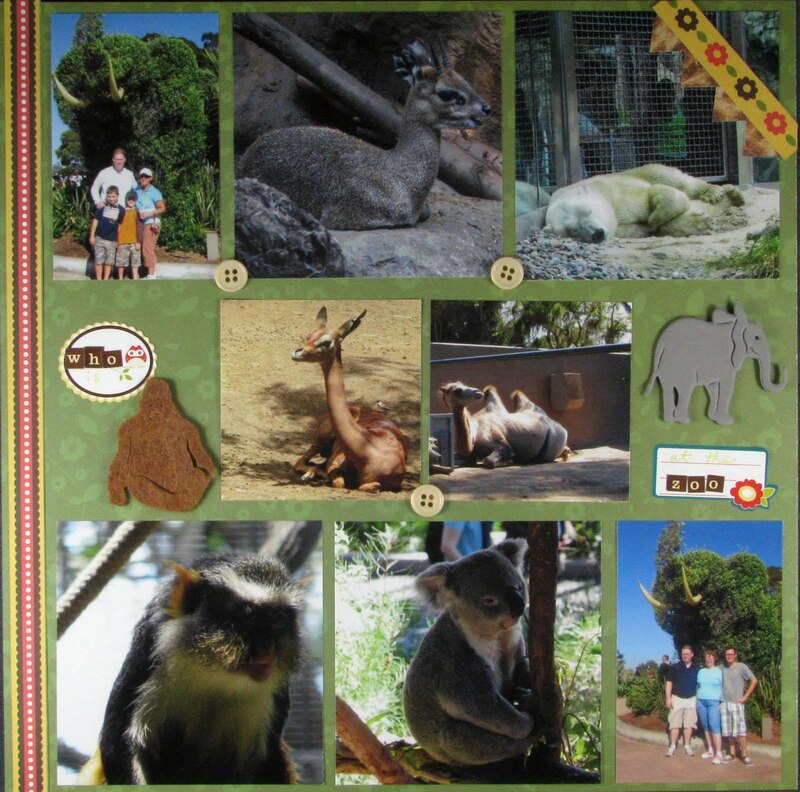 I have so many zoo photos left to scrap that I decided to make a layout with as many photos as I could fit on a page! I used Pebbles, a Sizzix cut foam elephant and a felt cut gorilla and some buttons to finish it off. 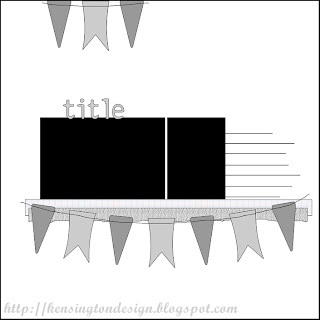 How's that for easy--you can definitely tell that I didn't spend any time on this layout, but that is ok. 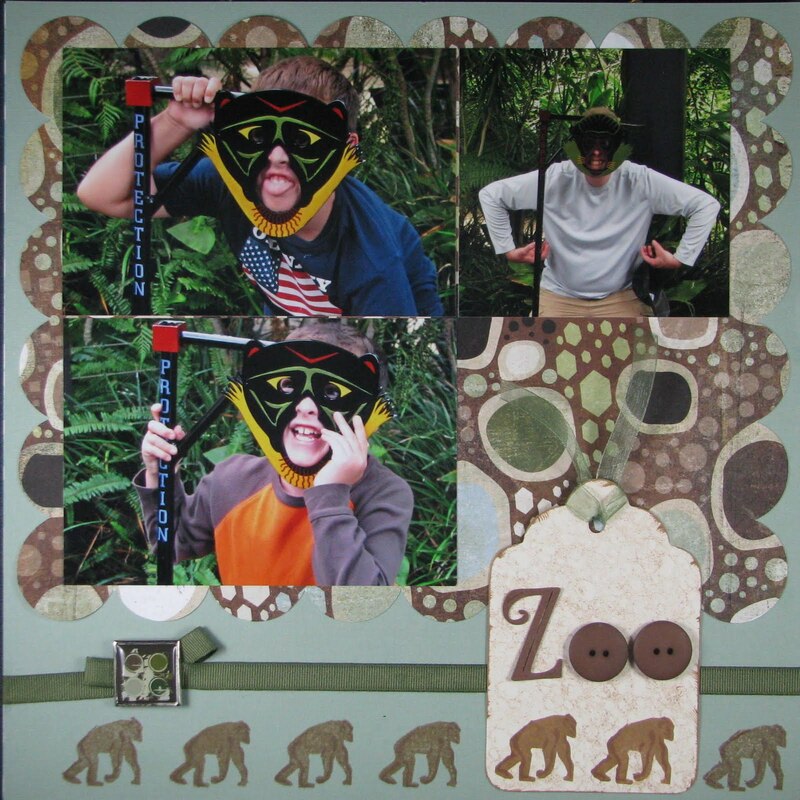 It definitely has a good representation of the animals at the San Diego Zoo. We had so much fun there that I couldn't help printing off way too many photos!!! Also, I was thrilled when Ursula Luserke custom made these darling buttons and sent them to me from Germany! She has quite the knack for making these! 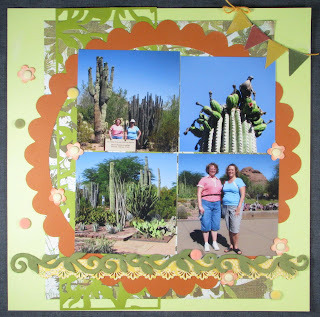 I loved the sketch from Sketch Inspiration (#235) this week, so I got back into my huge stack of photos from the Phoenix trip I took in June with my twin sister, Karen!!! 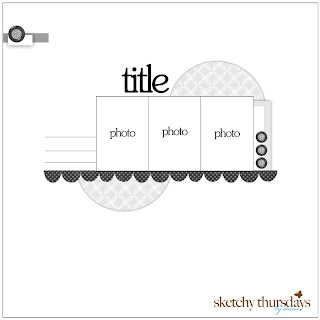 I totally love to scrap simply and get a lot of photos in my layout. 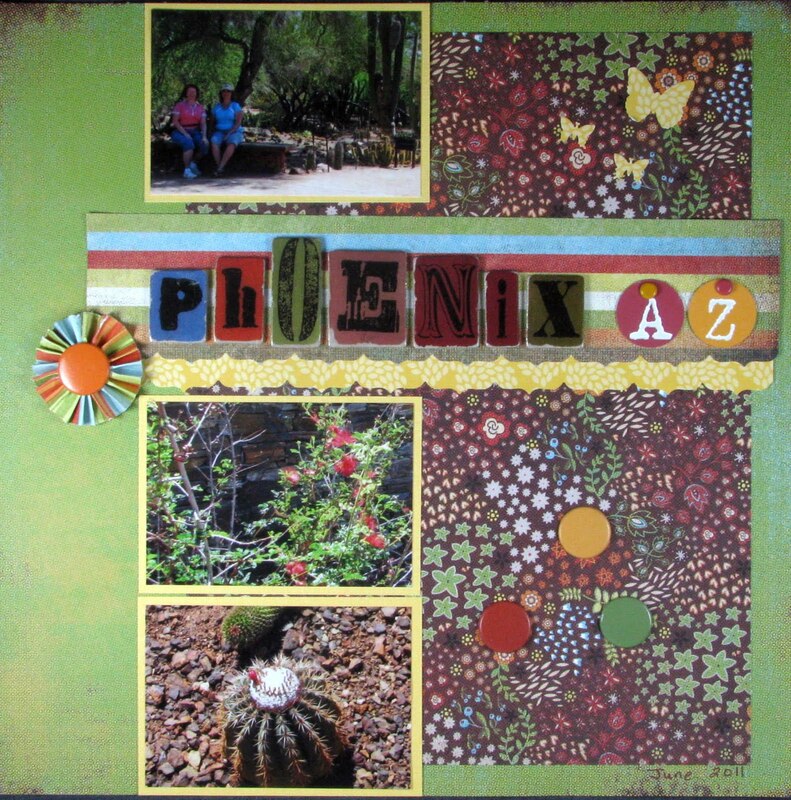 I used some Pebbles, My Mind's Eye papers, a fun flag from Nikki Sivils, some letter brads (maybe Paper Suite from Hobby Lobby), a fun journaling spot from Pink Paislee and some stamping/inking from CTMH for this simple layout from the Phoenix Desert Botanical Garden. I found a fun new (to me) anything goes challenge at CropStop, so I thought I'd give it a whirl. 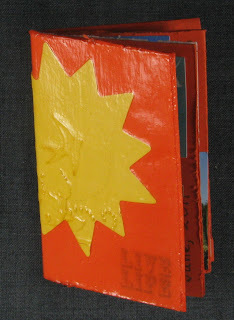 So, I decided to make a mini book. It is called an x-book! 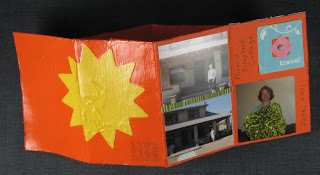 It is an easy book that you make with just one sheet of 8 1/2" x 11" piece of paper and then decorate! The only thing hard about making this book was the Modge Podge. It wasn't required, but I wanted to give the book some stability! I had embossed a cool bird and flourish image with a Cuttlebug folder over the sun before attaching it to the cover. I was also thrilled to be able to get 9 photos on the six "pages." The book is really tiny--about 4 1/4" by 2 1/4". I decided to use some of the many photos from the Phoenix vacation to fit The Paper Variety's challenge this week! 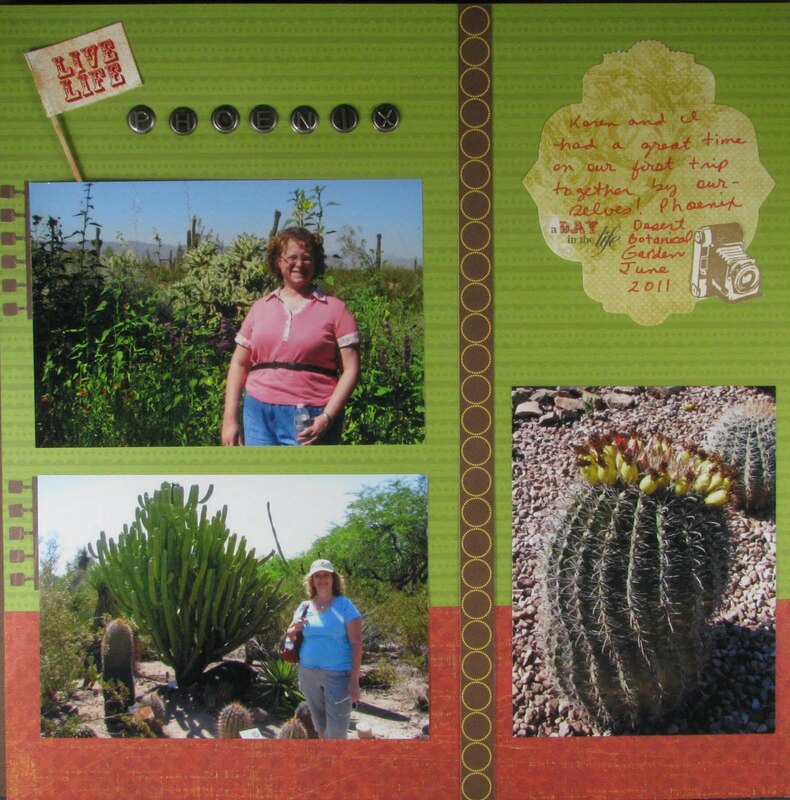 My son says this layout is too busy, and that may be true; but that is just how the Desert Botanical Gardens seemed to me at times. There were so many plants to see and they had a wild, untamed quality about them even though they were carefully planted and maintained by the garden's staff. I got the sketch from Inspired Blueprints, which is new to me. 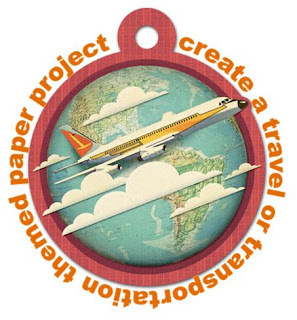 And, I'm entering it into Simon Says Stamp & Show Travels! Thank you so much for visiting! It makes my day to know that you stopped by to say hi! I was really excited when I saw this lovely paper and other goodies from Webster's Pages "box" sale! 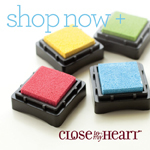 I knew they would go perfectly with the Engrained photos I took or had taken when my sister and I visited there! 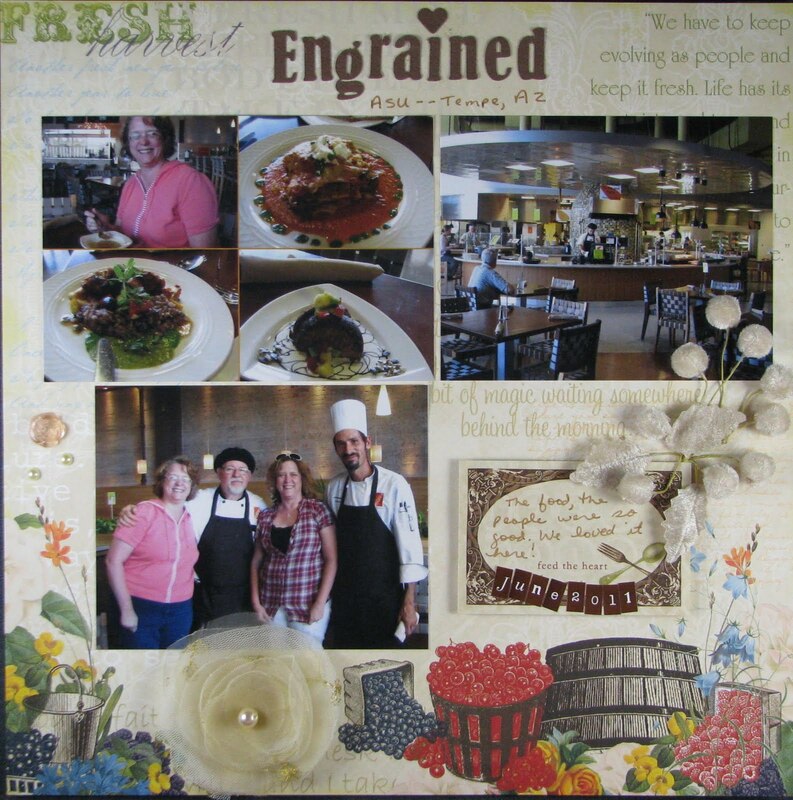 Engrained is all about sustainable, fresh ingredients! And, if you can see the words I left showing through the paper, you can see that it could be Engrained's mission statement! The food was so good there that I highly recommend you make the effort to get out to Arizona State University's Tempe campus and eat there if you are in the area (near Phoenix). It looks really casual inside, and the food is kind of served "cafeteria" style (though it is made fresh and brought out to your table), but it is gourmet food. The prices are pretty reasonable, too, considering you get a drink and don't tip there! Yum! I wish I could eat there right now! I made this for Simon Says.....Who wants some FOOD & DRINKS???? Thanks so much for visiting! I hope your week is wonderful! I realize this looks a little dark and boring in the photo, but it looks half-way decent in person! I'm in the mood to scrap some of my many Phoenix photos from the trip my sister and I took in June, 2011. I used Sketchy Thursday's sketch and a color challenge from Just Us Girls. I'm using up some of my stash. I decided to use 6 brads and some old Basic Grey paper that I've had for a long time. 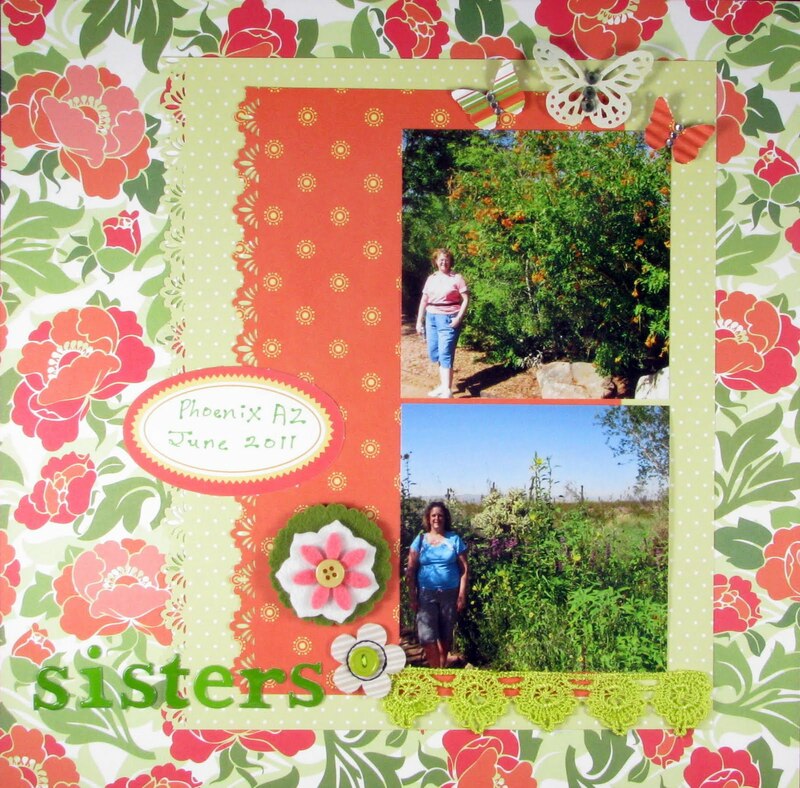 It is hard to tell, but I did use one of my favorite Fiskars border punchs on this, too! 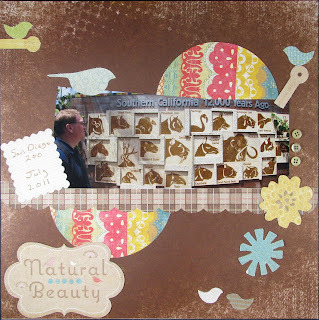 And, I made a rosette out of some left over paper from Scenic Route that I used on the last layout I posted! Thanks for visiting! It makes my day! This is my twin sister and me at the Phoenix Desert Botanical Gardens. This was our FIRST trip that we have taken with just the two of us since we left home so many years ago that I don't even want to count!!! I haven't played over at Artful Delight in a while, but I really loved this sketch and had some pictures that I thought would work really well with it! I'm also entering this at Moxie Fab World's Fabulous Felt! 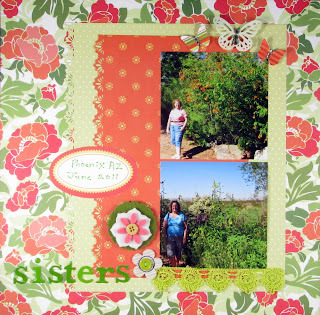 challenge (one of the flowers) and Simon Says Stamp challenge to add bling (to the butterflies). Oh, and here is a photo of the first day of the last year of high school for Mitch! 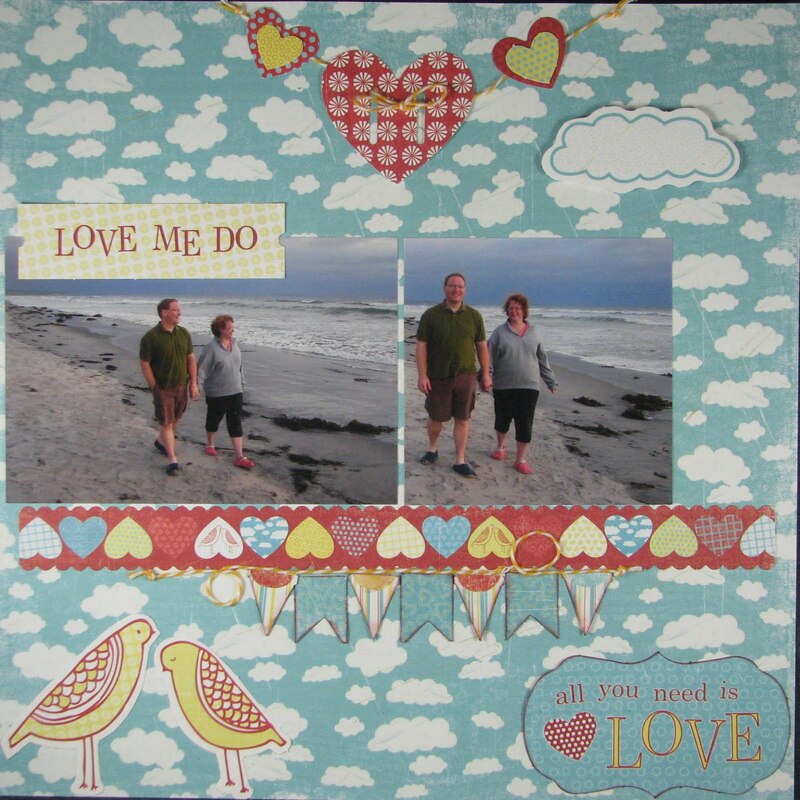 I decided to try out a new technique (to me) to fit with Lasting Memories layout challenge and added string to the bottom to meet The Paper Variety's challenge for this week. My new technique was to paper piece using canvas. 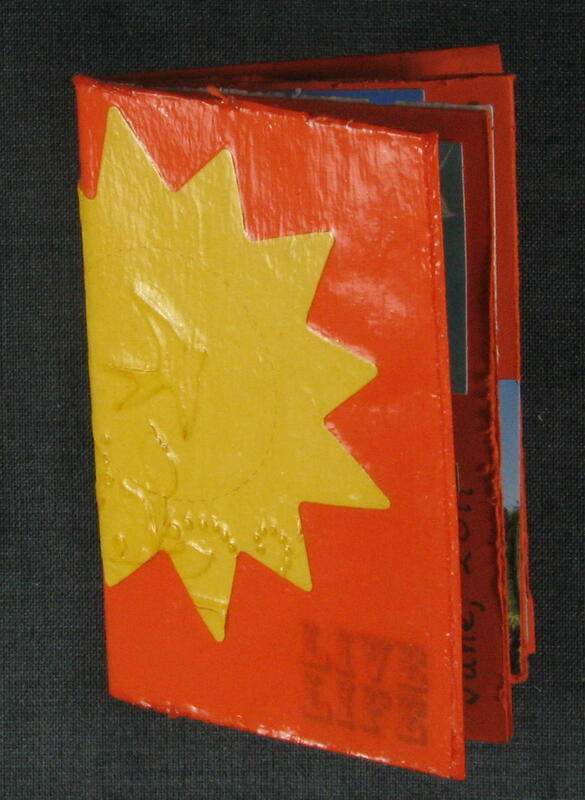 I also used some crackle paint on the chipboard and boat hull. 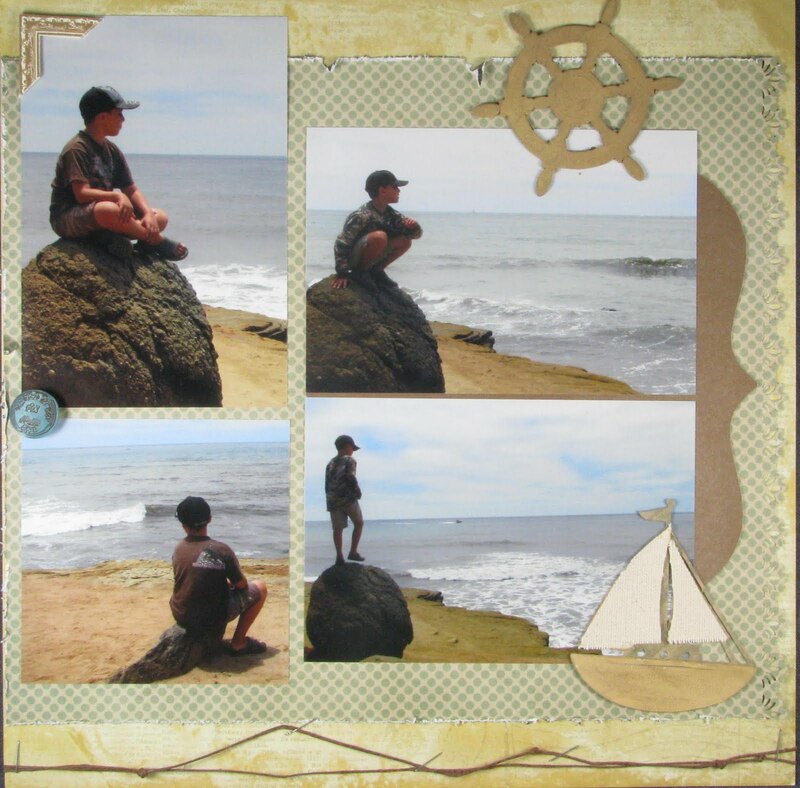 These photos were taken at Point Loma! It was such a beautiful place. I could have stayed there all day! Thanks for visiting! I really appreciate it! Have a great day! 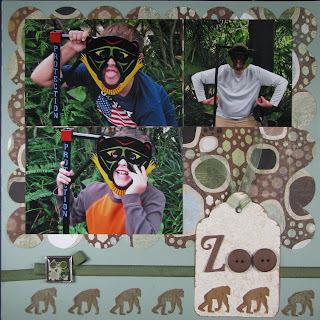 Here are some monkeys we saw at the zoo! These boys definitely follow the "like Father, like son" motto! This was a quick one. I just cut out some Basic Grey paper on the Cricut, added a tag with some buttons, some CTMH stamps to the bottom, some ribbon and a brad! 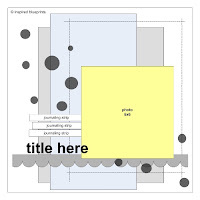 Yay, one layout completed! What a wonderful giveaway. I have not yet ventured too much into digi. This might be the kickstart I need. Congrats! I will need your email address to send to the people over at MyMemories! I made this layout for Fiskars and CK challenges. I used a Fiskars scallop punch on a spray misted coffee filter on all three different types of flowers that I made. The top one has a Sizzix flower base, but the rest have 4-6 Fiskars scallops. Gosh, I must have used at least 3 or 4 different mist colors to kind of look like the sand and the ocean. I also cut my coffee filter letters on the Sizzix. 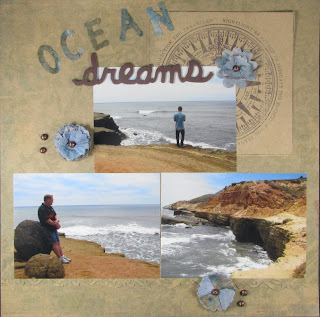 It is hard to see, but I also used the Fiskars Washed Ashore border punch on this. Now, why am I famous, you ask? Well, I was thrilled yesterday to get a surprise package from Fiskars. What did it contain? 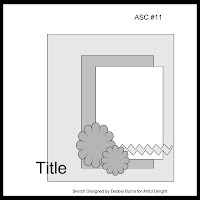 A new border punch which I helped name! It is called Falling for You. This particular punch is so great–-our family so loves trees and leaves–with the hubby being into wood-turning. I couldn't be more excited! First, I have to say Happy birthday to my wonderful Dad!!! Well, I have to say I went a little haywire with the Crate Paper sparkly die-cuts on this one! I guess I must have been in the mood for color since the mural only had a couple of colors in it! 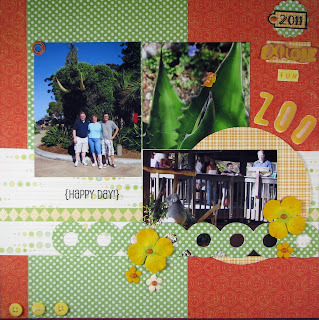 It also may have been because of the colorful Moxie Fab Tuesday Trigger: Luminous Layers challenge this week. I used a fun sketch from Sketchy Thursdays to make the layout of these two photos which I pieced together from our San Diego Zoo visit. I think you can tell that the inspiration came from the Tuesday Trigger and that Crate Paper made the perfect patterned paper for it. Who knows what happened from there! My layout also fits Frosted Design's challenge this week to include animals! Anyway, thanks again for visiting! I really appreciate your sweet comments! They make my day! I used this fun sketch from DCWV (Nana's Nursery Baby Boy AND Hittin' The Books stacks) and the citrus color challenge over at The Paper Variety to make this miscellaneous layout from the San Diego Zoo. I used JBS paint to stamp my phrases. Did you notice the poor little gummy bear who was impaled on a cactus??? 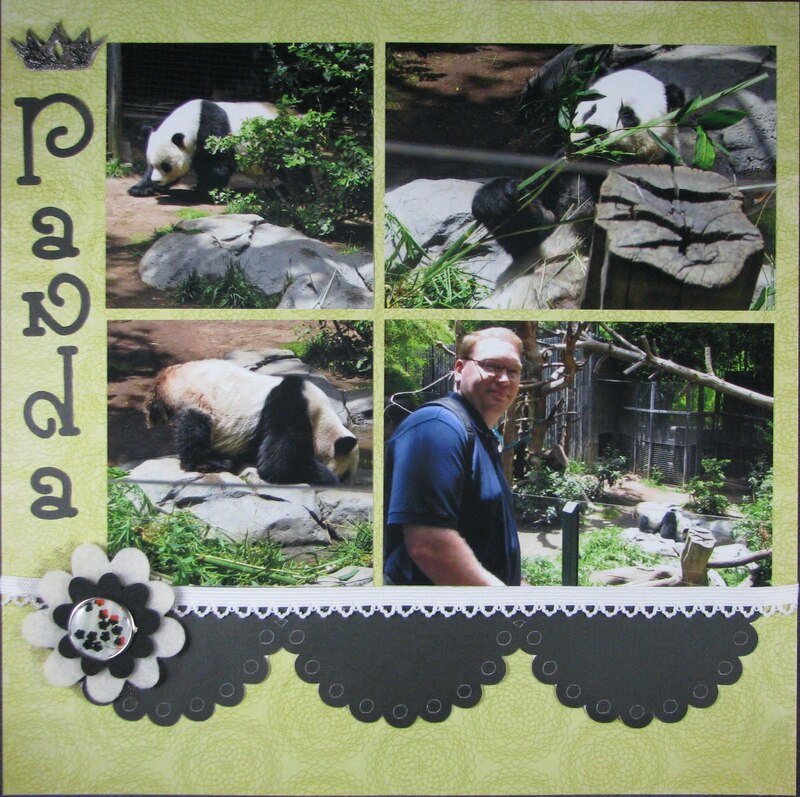 In keeping with the zoo theme, I decided to make a layout all about the Panda we saw at the San Diego Zoo. 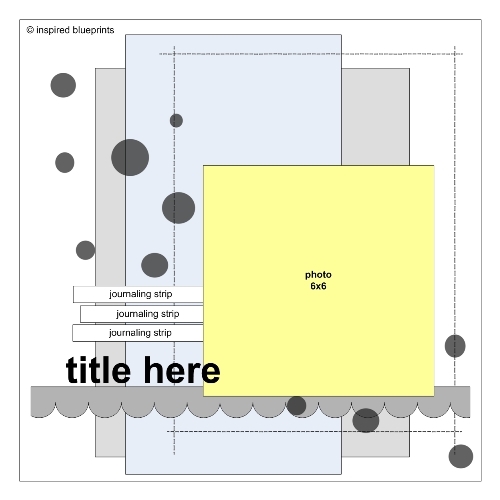 I am entering this in a challenge over at the CK blog to layer at least 3 textures. I layered the flower with some wedding/netting, felt, foam and a metal/epoxy brad which is layered over ribbon and paper! Thanks for visiting! Please leave a comment so I know you visited! Thanks and have a great day! 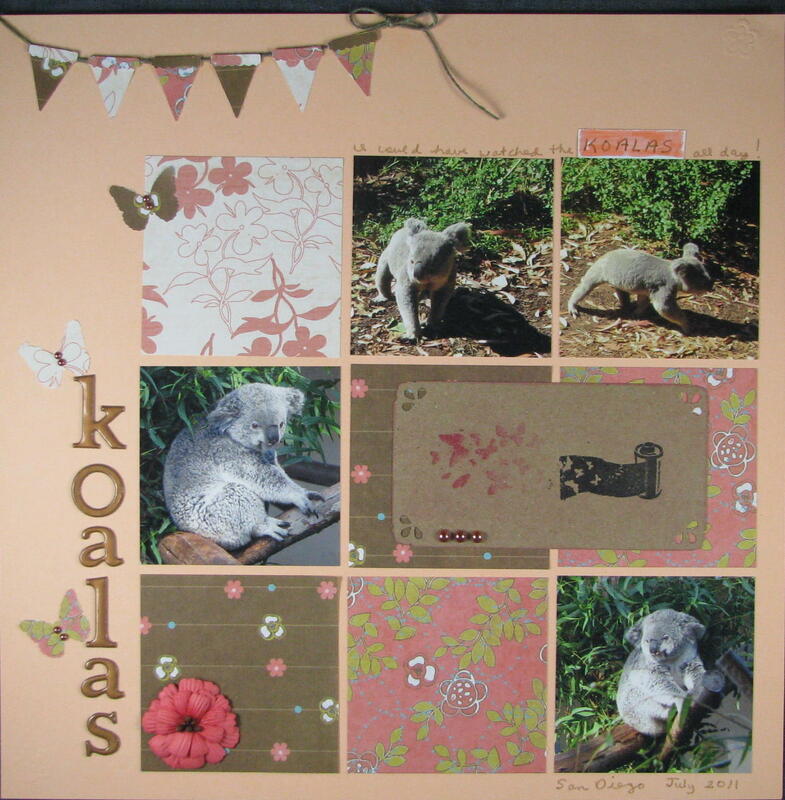 I used a cute sketch from Sassy Lil' Sketches to do this layout of some of the koalas at the San Diego Zoo. I could have watched them all day! 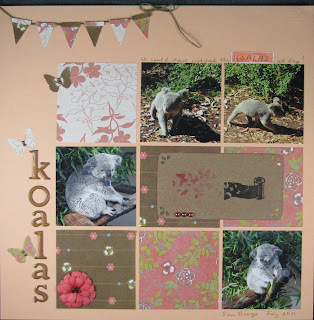 I think the koalas are so cute that they didn't need a lot of embellishments! 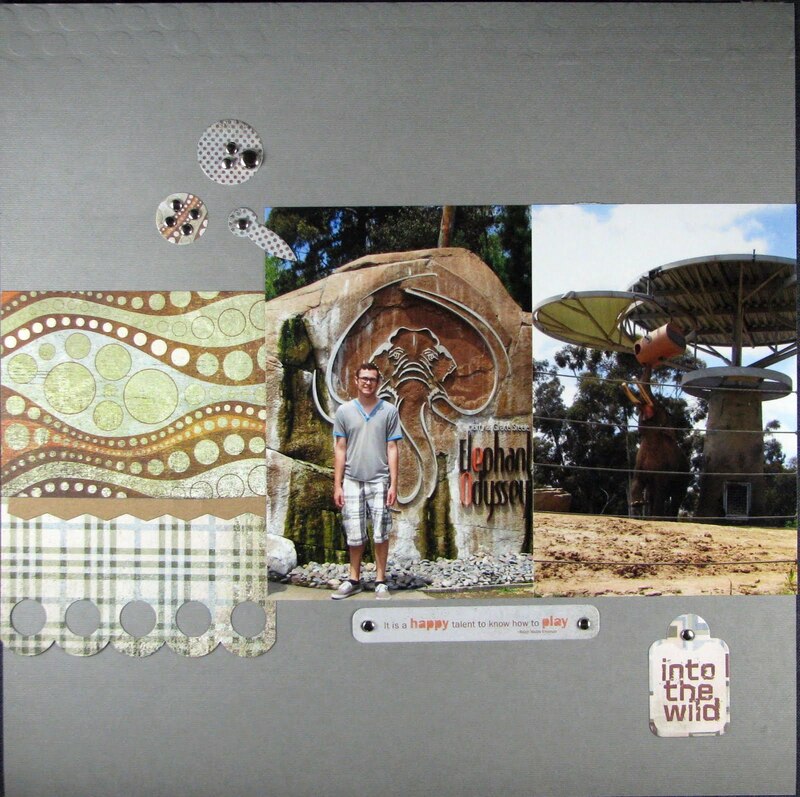 Card-stock and stamp are both from CTMH. 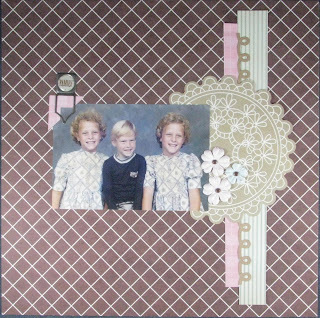 The patterned paper and flower are Prima. The butterflies are Martha Stewart, and the pearls are from Kaiser. The letters are American Crafts Thickers. The hemp is from my stash. Thanks for visiting! 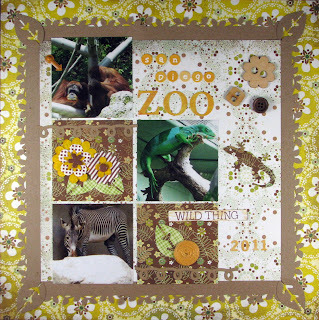 I hope you aren't sick of zoo layouts because I have MORE pictures!!!! Here's one of Steve and me walking along the ocean! 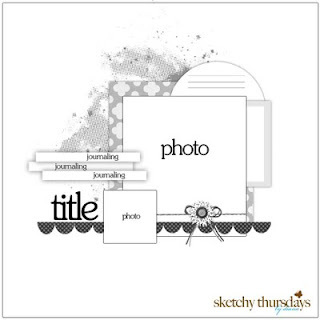 I used a sketch from Sweet Peach Crop Shop which I fell in love with as soon as I saw it! Everything except the twine, red ink, and adhesive is My Mind's Eye "Love Me Do" collection. You should see the goofy look on my face in the first one! No challenge! Just wanted to share this funny layout! My nephew saw this elephant at the San Diego Zoo and immediately got a wild look in his eye and got on and rode it for a while. I don't know what he was thinking! Maybe he knew he was a little too big for it... maybe he wanted a laugh... I wish I knew. It was so funny. I knew I had a great scrapbook page in the making when I took the photos! 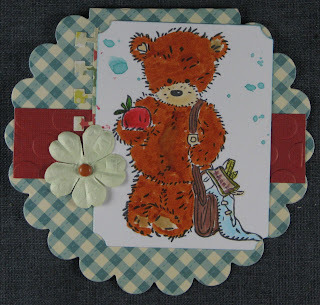 I made this little thank you card for the Crafter's Companion challenge this month. The little bear Popcorn is so sweet--it is from the School Days set! 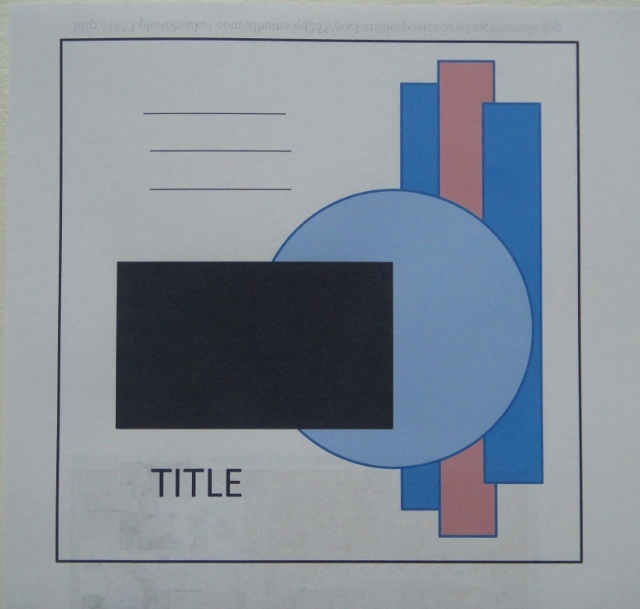 I'm glad I saved the little bit from a notebook border punch that I got to use at Archiver's. 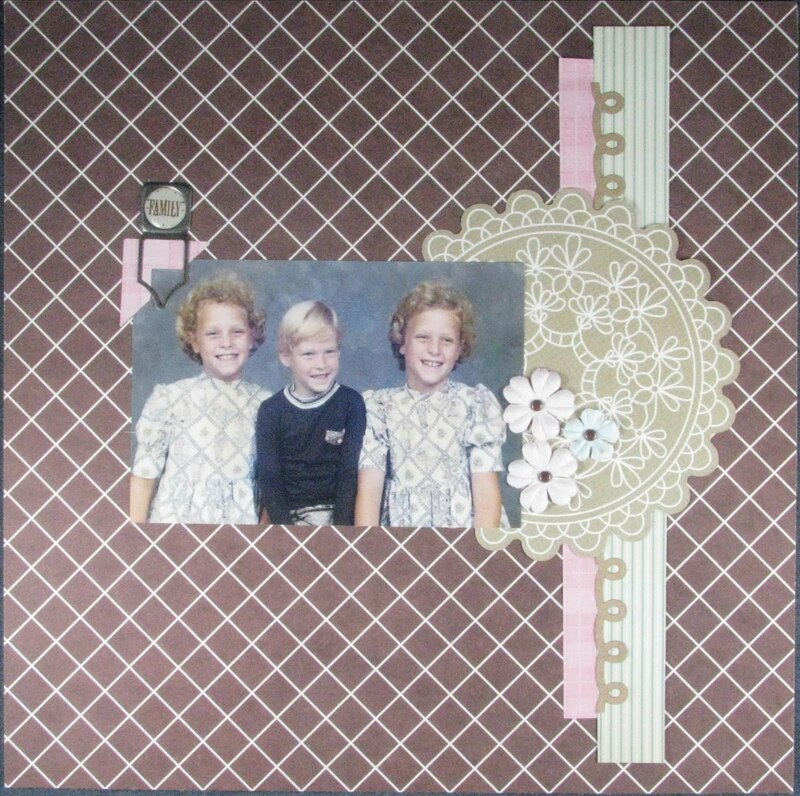 I'd love to have a notebook border punch, but this will have to do for now!!! Anyway, I added a little Tattered Angels mist droplets on th background. 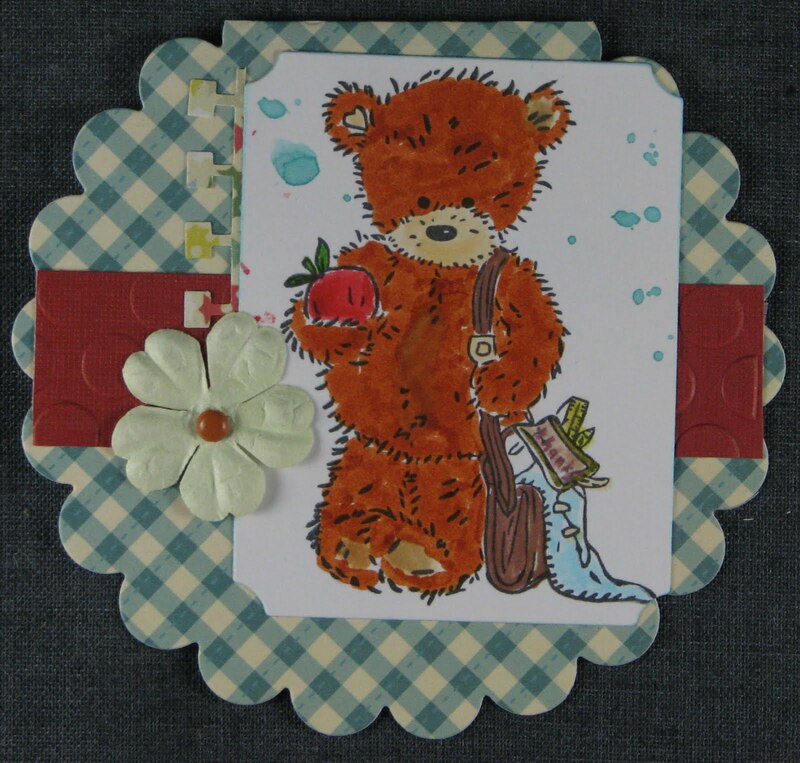 My coloring isn't great, but there is no way to make this bear not cute!! Thanks for visiting! I should be adding some layouts soon! 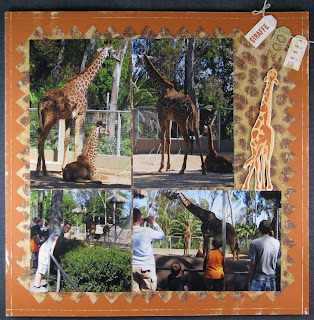 I made this layout of the giraffes at the San Diego Zoo for Scrapfit's Workout #49! I used some older CTMH giraffe paper which I put in the Cricut to make a fun background! This qualifies it for a little challenge I found on Scrapper Creations' blog. I also did a little embossing with my paper cutter. I made the banner out of some tags I stamped and some hemp! Simple-but picture focused--which is how I roll! Thanks for visiting! I hope you'll leave a comment so I know that you were here! If I haven't already visited you in the last day or so, I'll stop by your blog and say HI to you, too! 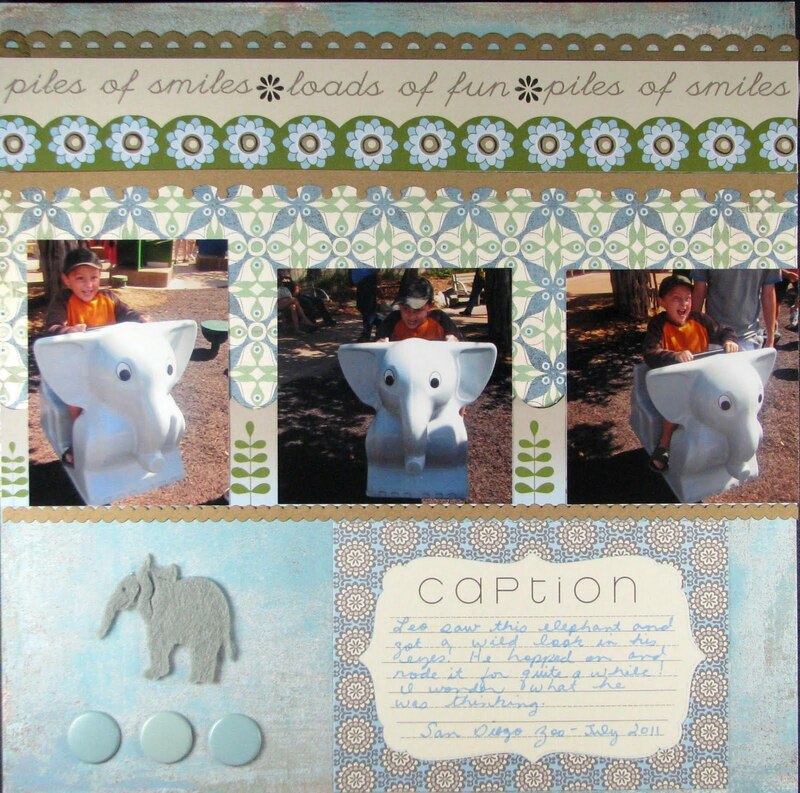 I made a two page layout of the elephants in the San Diego zoo, but I'm only sharing page one here! 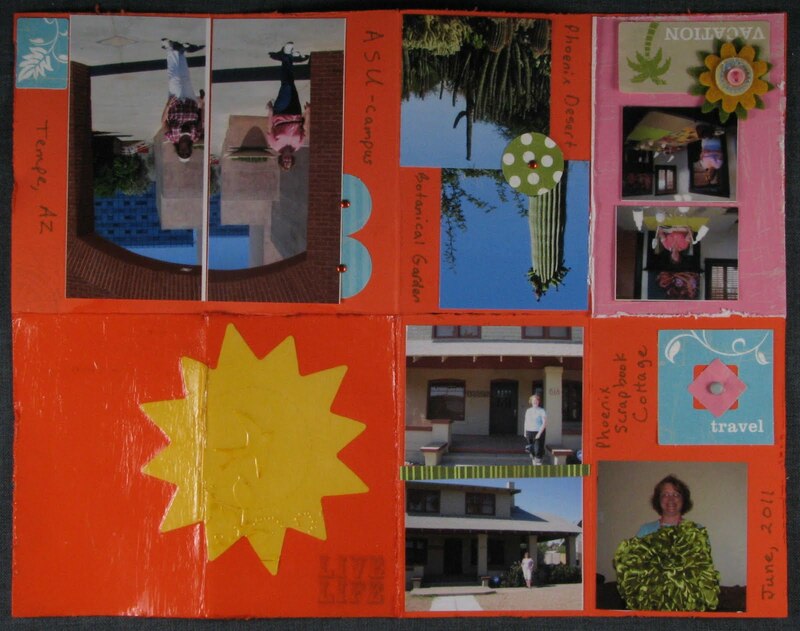 I don't know how to stitch the two layouts together--too lazy to figure it out. I love participating in The Paper Variety's challenges, and it has finally paid off. I was their winner for last week's challenge. 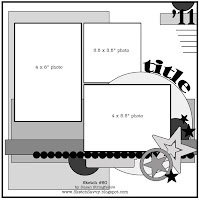 This week they want you to include at least four circles in honor of Scrapbook Circle who is their sponsor this week! Anyway, I used WAY more than four circles! Thanks so much for visiting! I've been scrapping a whole bunch this week. I should--I just got 375 photos in the mail last week! 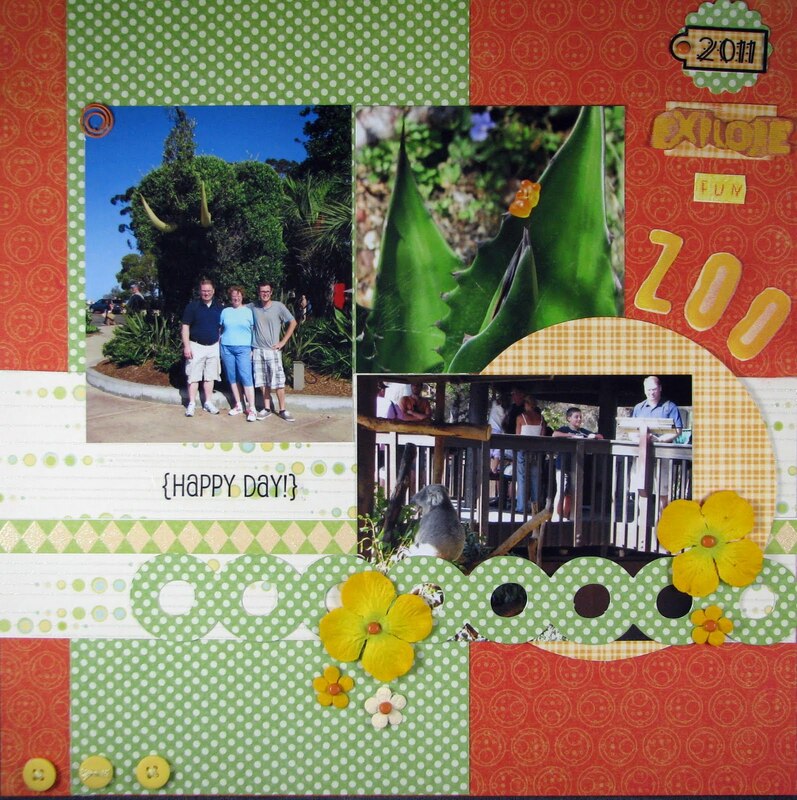 I used this week's Sketchy Thursday's challenge to make this layout from the San Diego Zoo. I took and printed so many photos from our trip. You'll be seeing so much more from the zoo as well as the San Diego area. The little yellow hemp flower is made with some Gluber's that I won from Cosmo Cricket!!! Yay! 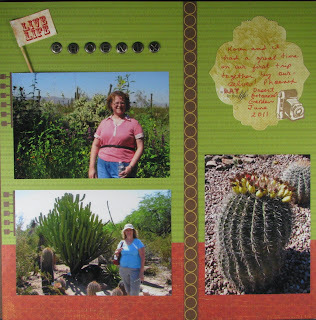 Also, the leaf border punches from Fiskars are from Tania Willis! Thanks again guys!